Replacing a hydromechanical grease interceptor, also referred to as a grease trap, can be smelly, expensive and unpleasant. But if you operate a food service establishment and need a new one, you don’t have much choice. In nearly all jurisdictions, commercial kitchens are required to have a grease interceptor to keep fats, oil and grease out of the sewer system. Coagulated grease is responsible for thousands — perhaps millions — of sewer blockages around the world, are expensive to clear and make sewer systems more costly to operate. Your existing grease trap may have corroded or degraded so much that it no longer works. Or maybe you’ve added new menu items or renovated and need an additional grease trap to stay in compliance. Or maybe your kitchen staff has been clamoring for something that’s easier to clean and maintain. Whatever the reason, you might want to do a little research before you just buy another piece of equipment just like the one you’re replacing. Although grease traps have been in use for more than a century, the technology has changed and there are now more alternatives on the market. To make your research a bit easier, here are several factors you should consider as you review grease separator options. The total cost of owning a grease trap goes well beyond the initial purchase. Other costs, including regular emptying of the unit and maintenance, can add up to a significant expense. Some automatic units are easier to clean, while high-capacity units may need to be emptied less frequently. The bottom line: Don’t make your decision based solely on initial purchase costs. Another major factor to consider is how easy your grease trap is to maintain. All grease traps must be emptied periodically and the accumulated waste disposed of. Some commercial kitchens empty traps themselves, assigning an employee to the task and simply dumping the waste grease into the trash. This is fine, so long as the job gets done. Waste kitchen grease can get smelly, so whoever gets this job is probably not going to like it. Other facilities hire an external company to regularly service the trap. This usually includes bringing a pumping truck on site to vacuum out the fats, oils and grease, and then delivering the waste to a landfill. In some places, used kitchen grease is recycled into biodiesel; if there’s a biodiesel plant in your area, you may be able to get a discount on disposal costs. How frequently your new grease trap will need to be emptied, how much that will cost you and how much of a hassle it will be are important factors. If you’re considering a type of grease trap that you haven’t used before, such as a high-capacity Trapzilla (an efficient alternative to a traditional concrete grease trap) your local installer or the manufacturer should be able to advise you on maintenance issues. Even with the simplest grease trap, there is a good chance that at some point some part will need to be replaced. After all, this is equipment that has to deal with grease, food waste, hot water and other kitchen effluent daily. How quickly and easily you can get the parts you need is something to consider now, rather than on Saturday afternoon of a busy weekend when your grease traps stops working and you need a new part to fix it. You should also ask manufacturers or dealers about any regularly scheduled maintenance that’s required and whether there are parts that will need to be replaced on a predictable schedule. Durability is the flip side of parts availability. Chances are you don’t want to be shopping for a grease trap again in a few months or a couple years. Traditional concrete grease traps corrode and fail after just a few years. The concrete simply can’t withstand the kitchen waste that is deposited into it. Modern grease traps and grease interceptors, on the other hand, are often designed with durability in mind. Thermaco’s units, for example, are constructed with stainless steel and corrosion-resistant polyethylene. Some Thermaco grease interceptors have been in use for almost 20 years. Long-lasting materials ensure you won’t need to replace the grease trap anytime soon. It used to be, that most restaurants had room for a big concrete grease trap out behind the building. Now, with food service establishments going into more nontraditional locations and space in many cities at a premium, the amount of space a grease trap takes up can represent a significant expense. So long as you’re replacing the grease trap, you may want to move it to a more convenient location. Depending on your kitchen layout, the size of your facility and other considerations, you may want to put the grease trap in a basement or between floors. Not all grease traps and grease interceptors can be mounted like this, even when it’s the best choice. Thermaco’s Trapzilla units, for example, can be ordered with accessories that allow it to be installed in a variety of locations. Naturally, none of the above factors matter if your new grease trap is out of compliance as soon as you install it. Commercial kitchens are regulated by several government agencies and various regulations, including the local health department, a local building inspections department and local sewer authority, as well as state laws, federal laws and various plumbing and building codes. Unfortunately, these layers of regulations add up to quite a few requirements for food service establishments. In some jurisdictions, certain types of grease traps or grease interceptors may be banned. 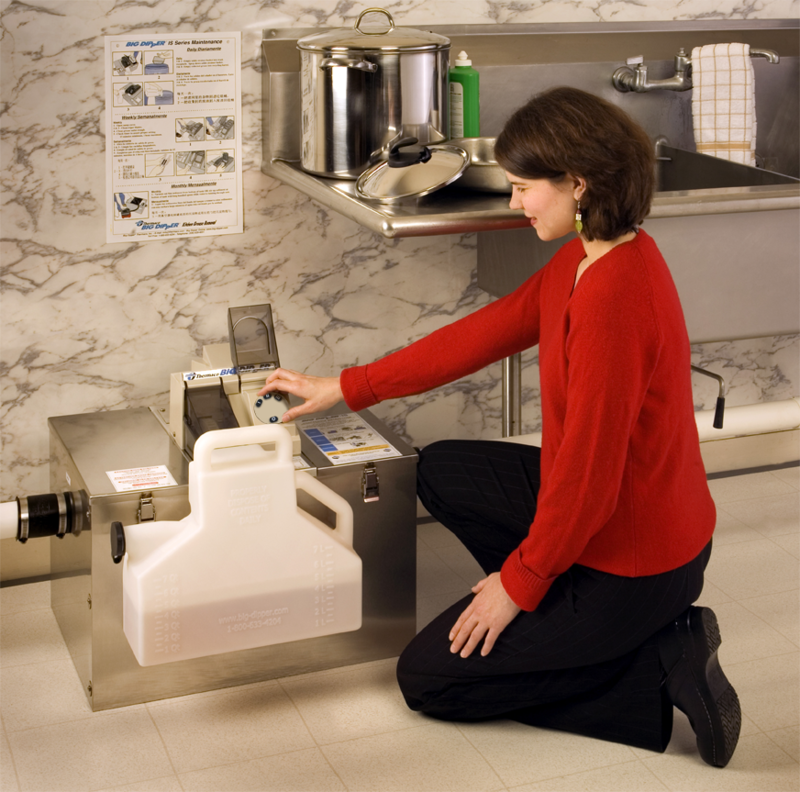 Local regulations will often specify how often grease traps must be cleaned, and in some cases may offer less onerous regulation in exchange for using different kinds of devices. San Francisco, for example, offered restaurants a discount on their sewer bills if they installed automated grease interceptors. Understanding what’s required — and sometimes the opportunity available — has to be considered when deciding what to purchase. Finally, you need to figure out how much grease might come from your commercial kitchen so you know how much grease trap capacity you need. This is called “sizing” the grease trap. The more grease your kitchen produces, the bigger trap, or traps, you’ll need. If you buy too big a grease trap you’ll waste money; get one that’s too small and you may be out of compliance with the code, have to clean it more frequently than you anticipated or even create back-ups. Sizing a grease trap involves calculating how much grease potentially could exit through your kitchen drains, given the size of sinks and other appliances that empty into them (except dishwashers, which usually are plumbed directly into sewer lines). But your menu choices (think steamed vegetables vs. bacon cheeseburgers), number of meals served and other factors will also affect how much grease leaves your kitchen. Keep those factors in mind as you decide what the right size grease trap is for you food service establishment.